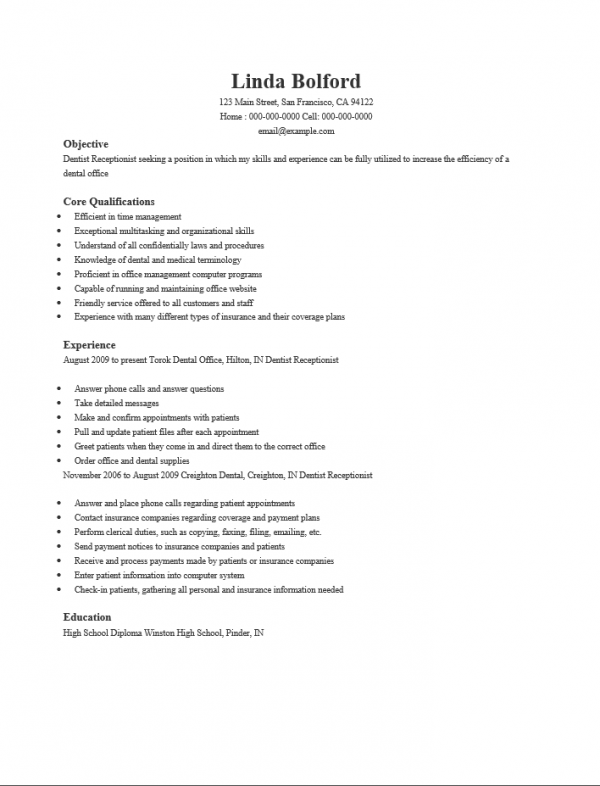 Dental Receptionist Resume Template provides direction to those who must compose a resume relatively quickly. A dental receptionist will face quite a bit of competition in today’s market. This is one of the few professions that will offer both dental and medical care as a benefit yet require only a high school diploma. Dental Receptionists will have to demonstrate (via a resume) their ability to handle this very demanding job. These professionals are the face of a dental practice and will have to manage patients who are often difficult to manage for one reason or another. This is in addition to additional duties such as billing or maintaining a filing system which will usually include x-rays and other diagnostic tools a dentist must use. It is therefore important that a resume reflect a candidate’s abilities and technical knowledge of office equipment. There must also be a certain level of vocabulary employed (i.e. technical jargon, buzzwords). Whereas a template may provide a standard set of sections in a visually pleasing manner, it is the content that a recruiter for this position will focus on once they pay attention to the candidate’s inquiry. An applicant’s should make sure their resume denotes an above average intelligence and a straightforward manner in communication. Step 1. Write your full name and contact information in the top section of the resume. This should take on a business card format as your name should be prominent in some way. Step 2. The “Objective” section will be where you report your intention to gain the position you are applying to. Be very direct in this section. Step 3. The “Core Qualifications” section will be the area where you specifically tout your skills and address at least some of the requirements listed in the job posting you are answering. This should be a bullet list and should highlight your abilities. Step 4. The “Experience” section is where you should list your employment history. Make sure to include the date range of each employment, the employer name and location, the official title of the job you held, and a synopsis of your responsibilities there. Be complimentary when possible but remember to be succinct. Step 5. The “Education” section is reserved for your academic credentials. Make sure to give the name of the degree you attained, where you attained it, and the year it was awarded.